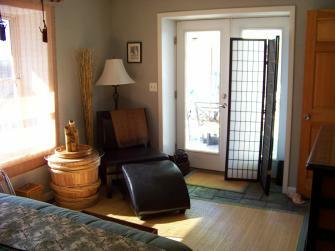 The Bamboo Room offers gorgeous views of the Blue Ridge Mountains.The private bath includes a full bathtub shower. The Oriental feel of the furniture is due to the fact that it has been collected from all over Asia by the owner. French doors open out on to the custom built deck from which the peaceful sounds of flowing water from 2 small ponds can be enjoyed. 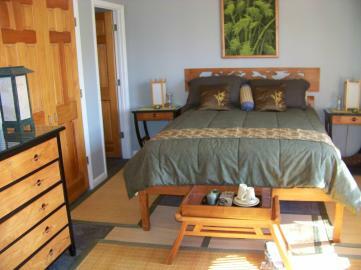 The price is $120.00 per night including full breakfast.